Eric was signed as a free agent by the Lions in February 2019. 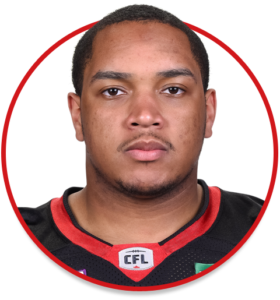 2017-2018 (Ott): Originally coming to the CFL as a free agent signing of the Ottawa RedBlacks in February of 2017, Eric appeared in four games over two seasons making a pair of starts. 2012-2015: Sticking close to home for his collegiate playing days, Eric appeared in 37 games for the Owls over a four-year stay with 25-straight starts in his final two seasons. Versatile and athletic, the New Jersey native played both tackle and guard capping his career with a first-team All-American Athletic Conference selection as a senior in 2015.